When I read this book, I was amazed and admiring, wondering about the perseverance and inspiration that could keep someone going so many years building a dream? And I remembered a similar story, though not so well known, here in Colorado, where a man has spent sixty years building a castle in the mountains. Here is the link to Bishop Castle! Nek Chand's own journey began when he and his family and community had to leave their beloved village when "the Punjab split into two countries: Pakistan and India." In the story, Barb Rosenstock explains that Nek Chaud's village was in the Muslim country of Pakistan and his Hindu family no longer was welcome. They fled for forty-two days across the new border into India. Yet, the problem was to where! Villages had been leveled in order to build the city of Chandigarb, a "sharp-edged city of colorless concrete." He did not know where he belonged. But one day as he worked as a government road inspector, he discovered acres of jungle, a wilderness. Thus began his "illegal" living, building his own hut, hidden behind old oil drums. Because of his longing for his old village life, he began roaming the countryside, gathering old pieces of that life: "chipped sinks, cracked water pots, and broken glass bangles in red, blue, and green." He carried them all back and began his creations like "curving paths, carved niched walls, and strung pebble-covered wire to make transparent screens." He planted with discarded plants from the dump. He made skeletons from twisted bikes and rusty pipes. And he kept the secret for fifteen years. Claire A. Nivola's illustrations paint the beauty of the countryside and art that Nek Chand loved and honored. What happened after being discovered? People heard about this fabulous place and protested the government's plan to bulldoze it down. The People saved this secret kingdom! The story ends with a fabulous gatefold page spread of real photos of Nek Chand's work, an author's note, a bibliography and the information about the Nek Chand Foundation at the end. Here is the link to the Foundation. Mr. Chand died in 2015, but until that "he spent each day in the Rock Garden, meeting with visitors, creating new plans, and supervising the continued construction of his kingdom." What a wonderful story. I've owned this book for awhile now... I really need to read it! I was amazed by the story, really an achievement from 'nothing' except his own creativity and persistence! Thanks for this recommendation, Linda. I've read two books about the partition of India this year: The Night Diary -- a wonderful historical MG novel, and No One Waits for the Train, a book of poems by Waqas Khwaji, who teaches at Agnes Scott College. I'd love to read more and this story looks fascinating. I have The Night Diary on my list, still need to read it, Laura. I've seen many praise it. Thanks for the other title too! 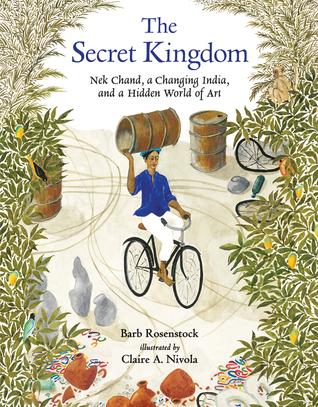 This book about Nek Chand is fascinating. I've looked for more about him too, to see more pictures! Thanks, Laura! It's Monday! New, New Titles! It's August - So #PB10for10 - Hurrah! 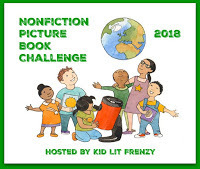 Non-Fiction Wednesday - Passing Go!